My parents had their yard professionally landscaped a few years back and the designer filled their garden with lavender, as designers do. My parents found out that lavender looks and smells wonderful . . . until the third year when it starts to get woody and misshapen and awful-looking. My mom has been slowly replacing sections with much better plants. My mom is effortlessly good at almost everything and she probably could've designed a better garden right out the gate. A year ago she and my dad went to the Sunset test gardens and saw Salvia 'Amistad.' 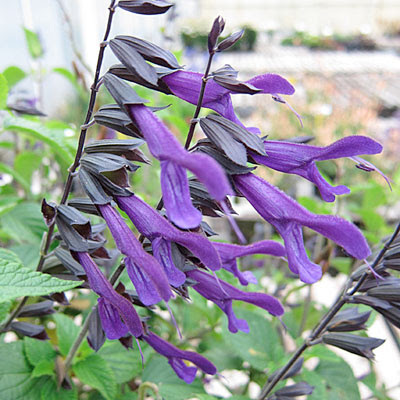 It has the black calyxes of Salvia 'Black and Blue' with deep dusky purple flowers instead of hot blue. My mom ran all over town trying to find it, finally locating it at Orchard Supply Hardware. All I could think at the time was, "I learned it by watching you!" Parents who plant lust have children with plant lust. My mom planted a huge swath of Amistad right outside her kitchen window and it's GORGEOUS. And it's covered in hummingbirds all day long. Brava, mama. I sort of forgot about it until Scott posted about the Garden Bloggers' Fling and their visit to the Sunset gardens and Salvia 'Amistad' (picture here). We decided to try our luck at Orchard Supply, which just opened in Oregon, only to immediately file for bankruptcy. This could be our last chance! I decided to call OSH first, just to make sure they had it. At the Beaverton store the garden associate asked me, "What's a selvia?" After spelling it out he asked, "Is that like Sativa?" They didn't have it and I no longer had any faith in their garden department. The Tigard store said, "Oh yeah, we have that." We have blue and red. Is it one of those?" So we skipped OSH and hit up Joy Creek, Means, Cistus, and Garden Fever instead. We didn't find Amistad but we found all sorts of other things to fill my backseat. I think it's fitting that "amistad" is Spanish for friendship. How many friendships have been forged over plant shopping trips? That night I was at my friend Carrie's house and I looked at a new potted arrangement she had created. The salvia looked an awful lot like Amistad. Plant people are the best because she didn't even blink when I told her that I needed to know what that was RIGHT NOW. She dug out the tag and, sure enough, it was Amistad. She'd gotten it at the Fred Meyer grocery store right next to my house. The one I'm at every week. Greg immediately chimed in, "You want to leave right now and go to Fred Meyer, don't you?" It was 9:30pm. He knows me so well. At least we know we can blame this one on genes! Instead I waited like a normal person and went first thing Sunday morning and got one for me and one for Scott. The stats: Hardy in zones 8-11. The stated size is 3-4' high by 3' wide but my mom's is much taller than that (hers is on a drip, which might help). Full sun or part shade and it's drought-tolerant, though salvias never seem to mind summer water. If you're in desperate need of one let me know and I'll pick one up for you. And thank you, Carrie, for unknowingly finding the Holy Grail. The one at the Sunset Western Garden was enormous! It's a beautiful flower. Black and Blue seems to be struggling in my garden, so I'm not sure how this would do, but it sure is beautiful. It's amazing sometimes what we can find at Fred Meyer! I loved this plant in the Sunset test garden but assumed that it wouldn't be hardy here so didn't give it much thought. Then, the other day I saw it at a local nursery and was tempted but passed because the price was a little high. I'm getting dressed and checking out F.M. right now! If they don't have it by the one near you let me know and I'll grab one and give it to you on Sunday! Are you in 8b? I always assume you're in the same zone as me but I could be wrong. Of course, I have sandy soil where everyone else seems to have clay, which helps a lot. I am impressed beyond words that you waited until the next day to plant shop at Fred Meyer after you learned these salvias were there. What control. I'm glad that you finally found your Holy Grail and thanks for the trip down memory lane with that video. Now go fry an egg and tell people it's your brain on drugs! I need a support group for plants from your blog that I covet that aren't good in 7a! I'm so sorry that I'm making your zonal denial flare up. I feel like it's a curse passed down from whoever is in the next warmer zone. I'm coveting everything from 9a! I know! I should get a medal, right? You could hang out a shingle as a private eye. I think it would be so fun to be a PI! Now I have that Hall and Oates song in my head . . . Thank you AGAIN for picking mine up! It's so funny how these obsessions work...and now that we have our precious 'Amistad', what will be next!?! BTW...I caught a raccoon trying to dig mine out of its pot last night...I'll be moving it to the backyard after all! Always! And I can't believe that raccoon! What a jerk. Good for you! The treatment for zonal denial is expensive. Oh man, why am I reading this post so late? I need one too! My FM store is nothing left except sad brown plants that are reduced to clearance prices...good score!